This article will explain to you how we can create our own custom tabbed page. 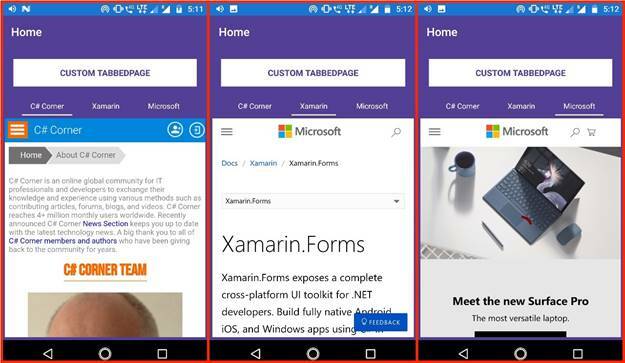 The Xamarin.Forms TabbedPage consists of a list of tabs and a larger detailed area, with each tab loading content into the detail area. But If we want to add some extra controls top of tabbed page or bottom of the tabbed page we can't; in that case, we need to create our own custom tabs. So, this article will explain to you how we can create our own custom tabbed page. This article's source code is prepared by using Visual Studio with MAC machine. And it is better to install the latest Visual Studio updates from here. This application is targeted for Android, iOS. And tested on Android device & iOS simulator. This project is Xamarin.Forms PCL project. In this article, we going to create three custom tabs such as C# Corner, Xamarin, Microsoft. Let's start creating Custom TabbedView. 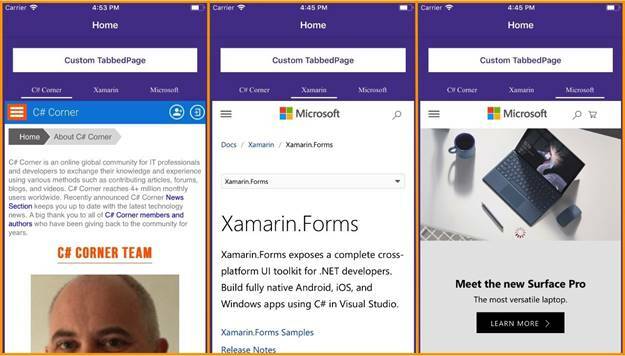 First, follow the below steps to create the new Xamarin.Forms project. Click on the File menu, and select New Solution. In the left pane of the dialog, let's select the type of templates to display. Multiplatform > App > Xamarin.Forms > Blank Forms App and click on Next. Next Enter your app name (Ex: CustomTabbedPage). At the bottom select target platforms to Android & iOS and shared code to Portable Class Library and click on Next button. Then choose project location with the help of Bbowse button and click on create. Now, the project structure will be created like below. Create a class with RibbonView name it should inherit from ContentView and place it inside ControlsToolkit -->Custom folder and add code. Here we gave ViewModel object to BindingContext to the view. And BindingContext will help to get or set an object that contains the properties that will be targeted by the bound properties that belong to this BindingContext. In this, we need to create the following properties and commands. LoadURI(for dynamic WebView URL based on tab selection). In HomeViewModel constructor we are assigning items to listTabs; it will return the number of tabs, so, however many tabs we want for displaying those items, we need to add to listTabs. In OptionSelectionChangedcommand we will get the SelectedTab index and based on that index we need to change the content of the detail area for each tab. In this article, we are changing the Web Source. For example, if we want to display the listview with a different source for each tab in that case just change the ItemsSource based on selected item index. And one more example is if want to display different UI for each tab just make a design with StackLayout and based on tab selection index, with the help of IsVisible Binding for layout we can display different UI for each tab.